That is me teaching English! 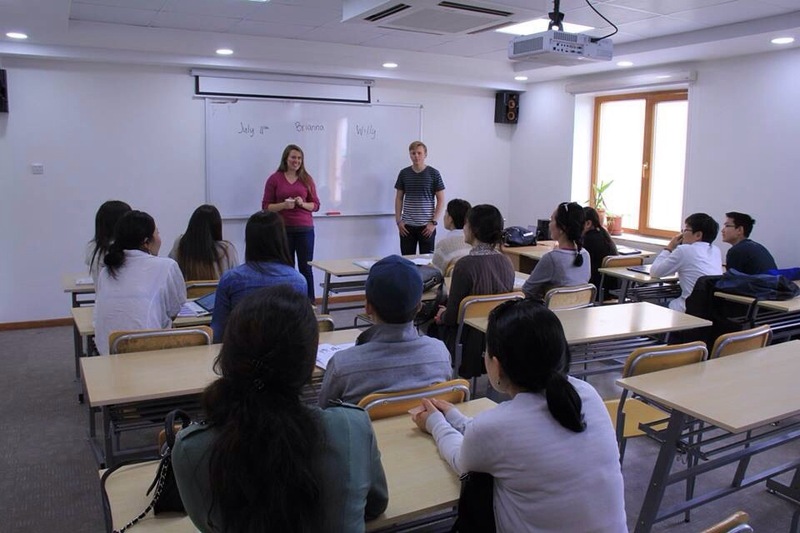 We have gone to a few places to teach English, the majority being to elementary and high school students. This was the first group I had teaching college-age. It was so fun!! It is fun talking to the Mongolians about America and how not every state is the same. People are interested to see what Mongolian words I know (a sad few words…) my communicating when they don’t speak English has a lot of hand motions lol. They found it particularly funny that I picked up that people say “bano?” When answering phones here, and it was a bonus that they understood the few Mongolian words I do know. I wanted to share a cool story with you though, one of my encounters with a Mongolian girl was very cool. We go to English practice Tuesday nights at a cafe, and at one cafe I met a girl named Buka. She speaks very well, seriously knows everyone, and we connected as friends. She hadnt come in a month or 2 so it was totally perfect timing she was there. We talked about our beliefs, I talked about Jesus and she said she doesn’t believe in anything, just herself. She said she has gone to a few churches and likes the inspirational messages. She asked me about my past relationships and if I ever got my heart broken, so I got to share some of my story and of course talked about how much and why I love Jesus. At the end she was complaining of a headache, so I asked to pray for healing and explained that Jesus likes to heal people and I’ve seen him do it before. She said I could and after I prayed I asked how she felt and kind of in awe she said that she felt really warm and the pain went down. I was like that was God touching you!!! I asked to pray again and she said yes, again she felt warm with even less pain. I got to explain that when you have a relationship with Jesus his spirit lives inside you and that is who healed her, Jesus in me. I had to leave shortly after and then saw her at church the next Sunday. She brought a friend and again knew so many people at church – and I don’t think she had been there before. As we were walking to lunch she told me that 30 min after I left Tuesday, all the pain in her head went away! I got to tell her more about Jesus and when she asked how you get rid of bad dreams I told her when Jesus lives inside you, you have his authority and power and you can just tell evil spirits to go away and they have to listen to you. Then I got share with her the Creation to Christ story we learned. A quick side note – Here in Mongolia spiritual experiences are a norm and people are used to having scary experiences with demons and going to shamans for help, health concerns, along with a variety of other reasons. People here are very spiritually sensitive and really like “good spirits” which of course we have the best “good spirit” Jesus living inside of us. People are amazed at how peaceful and joyful we are and naturally get pulled in. We were taught as a team to explain how creation really happened with God being the most high and mighty spirit that loves us and how when we first created everything it was all good. Since there are so many different stories about evil spirits and spirits in general and where they come from, we talk about the devil and how he and the angels that followed him were kicked out of heaven – and they hate us and try to make us believe that they are good and to follow them – and that’s why there are so many bad things in the world. Then you tell how Jesus (God) had to come down in human form and be the sacrifice that saves us because we were separated from God because of sin. And because he rose from the dead he defeated sin and death and we can be connected with him again and he lives inside us and that’s what makes us protected, healed and secure. After I told her she said it all made sense. It was one of those “did that really happen? !” experiences. I’m praying God encounters her even more and that she accepts him into her heart. Wanted to share that encouraging story with you all. 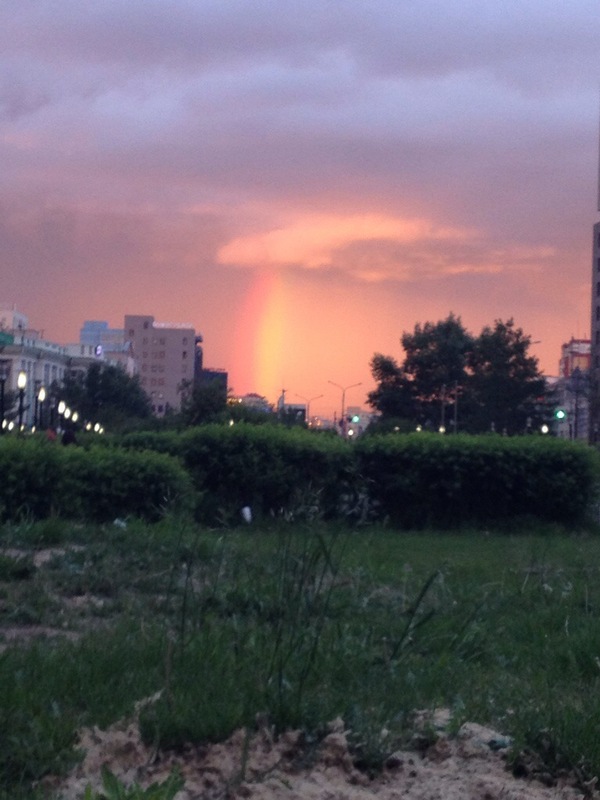 Also, check out this cool rainbow that appeared in the sky last night!! God is faithful!